The article is an overview of the popular Italian gas boilers for domestic use, Biasi. 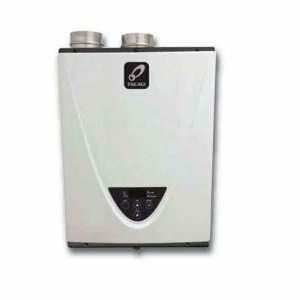 Biasi boilers are compact and wall-hung units that are designed as the combination and system gas boilers for use in a direct home and residential water heating or space and indirect water heating. Biasi produces several tankless models, grouped into four categories, all with the warranty ranging from 2 to 5 years. Inovia and Advance Plus series are the groups of the high efficiency condensing combi and system boilers from Biasi manufacturer. There are three combination models with the maximum power of 35 KW for both series, and one systems boiler with 25 kW in Inovia series, while Advance Plus offers three systems boilers ranging from 16 to 30 kW. Both groups of gas boilers utilize the advanced features such as the full pre-mix modulating burner that is able to produce hot water with the efficiency of close to 89% and maximum water flow of 15.6 L/min. Both Inovia and Advance Plus group of gas boilers include the quad technology that allows boilers safely to operate even if the unit shows the faulty code. The intelligent technology comes with the several benefits for the users; programming, easy control and monitoring, reliable operation and self-diagnostics for easy troubleshooting. All of the above features provide better comfort for the user, clean gas burning and low NOx emission, which makes the boilers environment-friendly. As the additional benefits, Biasi boilers from Inovia series, as the most advanced boilers from this manufacturer, can be connected to the hot water cylinders, solar thermal system, radiator, and underfloor heating system and controlled independently with the built-in programmable thermostat. When comparing the models; NOx emission is lower on the Advance Plus models. The Advance Plus combi and system boilers come with the digital self-diagnostic and historical fault diagnostic, while Inovia boilers have a built-in self-diagnostic LED indicator, 7-day time control and the timed pre-heat function that preheats domestic hot water. 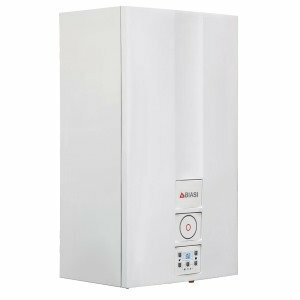 Other groups of Biasi boilers are Riva Plus and Riva Advance, also designed as the combi and system gas boilers, but with the shorter warranty of 2 years. The design of Riva Plus is simpler than the above models, which makes it less expensive and more affordable. The main features are the stainless steel DHW heat exchanger, a new recuperator heat exchanger made of aluminum and specially designed to extract even more heat from the flue gases, modulating fan and gas burner for the optimized gas combustion. The control panel of the above Biasi boilers consists of easy-to-use control knobs for adjusting the temperature of both DHW and central heating temperature, temperature, and pressure gauge, self-diagnostic LED light indicators and the built-in 24-hour digital programmer for easy control. Riva Plus models are found in two sizes; 24 and 28 kW, with the efficiency of 88% and maximum water flow of 11.6 L/min, recommended for two bathrooms. The self-diagnostic system is also part of the boilers, so like the option to use the propane LPG gas. 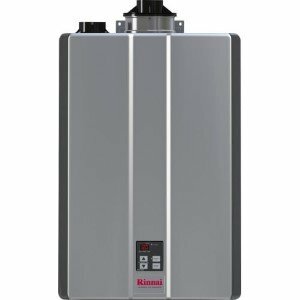 Riva Advance group of gas boilers also has one model with the power output of 24 kW that is designed as the combi and system type and more powerful 32 kW unit that operates only as the combination boiler. This model can provide even more hot water of 14.2 L/min. The efficiency is close to 90% while the emission of the NOx gases is lower than the Riva Plus models (37 vs. 95 ppm). Another great advantage is that the Advance group can be combined with the solar thermal system and hot water cylinders, therefore, taking the advantage of the free solar energy. The control panel is the same as the one found on Riva Plus but with the 7-day programmer. Other differences include the Giannoni pre-mix stainless steel condensing heat exchanger, high-performance DHW HE also made of SS, and electronic controls for the optimized gas/air ration. 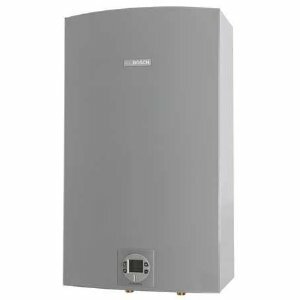 The above features are from the combination boilers which are used for both space and DHW heating all packed in one compact unit, while the system models do not utilize the DHW heat exchanger and its hydraulic components but are combined with the unvented hot water cylinders.